Content locking has been a long requested feature of OptinMonster. After adding real-time behavior targeting and completely redesigning the builder in OptinMonster 3.0, one of the first things in our list was to bring content locking to OptinMonster. Content Lock allows you to block portion of your content for subscribers only. Content lock requires users to enter their email address in order to see the content. If a user is already an email subscriber, then they will see the full blog posts. Those who aren’t subscribers, will see a blurred version of a blog post. Gated content is a great strategy for blog posts and long articles because it’s one of the easiest ways to get more email subscribers. Normally content lockers are sold as separate WordPress plugins or scripts. At OptinMonster, it’s included for free as part of the Plus and Pro license. 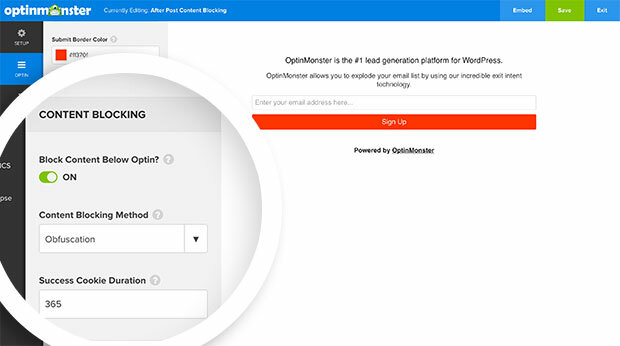 Simply login to your OptinMonster account and create an after post / inline optin form. Under the Optin tab, you need to turn on Content Blocking. Obfuscation – Blurs out the text below the optin (default). Removal – Removes the text completely below the optin. Once you’re done, simply embed it in your blog post or content area. If you’re using WordPress and want to automatically add OptinMonster content locking after specific paragraph, then you can use the embed code in combination with Insert Post Ads plugin. Detailed step by step guide instructions on how to use OptinMonster’s Content Blocking feature. Our team is working on adding several new templates for each campaign type. Over the next few weeks, you will see a lot of new themes being added to OptinMonster. If you haven’t seen our new Display Rules Engine that we launched in OptinMonster 3.0, then you should definitely check it out. We’re taking conversion optimization to the next level. Please try out OptinMonster Content Lock feature and don’t forget to share your success stories with our team. P.S. What are you waiting for? 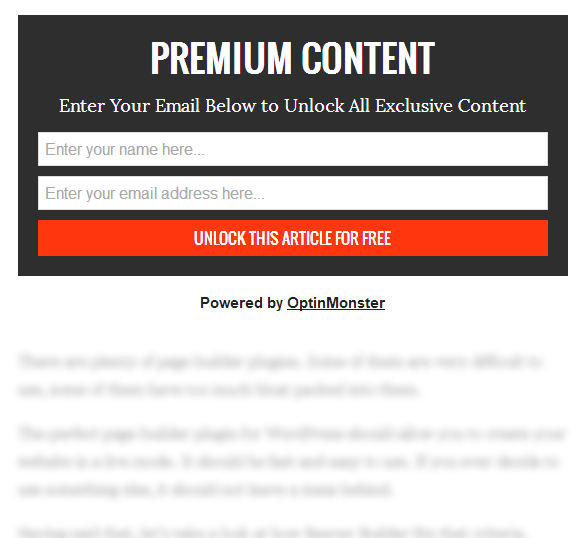 Turn your blog posts into a lead generation machine with OptinMonster’s Content Lock. Get Started with OptinMonster Today!